Private jets. Tropical vacations. Jason Bond isn’t shy about promoting his millionaire lifestyle. But that can’t be you, right? Well, according to Bond, it can. If you follow his proprietary strategy, you can challenge some of Wall Street’s best and come out on top. Perfecting his game in the small-cap and penny stock arena, Bond believes the market isn’t a matter of luck, but simply having the right skills at your disposal. In this Jason Bond Picks review, we’ll tell you if it’s all an illusion, or if he really has the golden touch. ​What is Jason Bond Picks? ​​Who is Jason Bond Picks Best For? 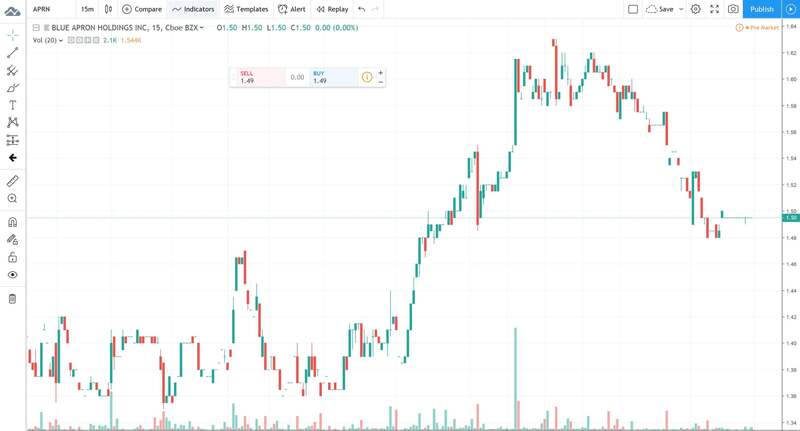 Jason Bond Picks is a stock trading advisory service that employs a small cap swing trade strategy to generate substantial profits in the market. It's a bit more of a stock picking service than trading education service. Jason Bond, founder and CEO, claims to have made millions after leaving his job as a teacher in 2011. The site Jasonbondpicks.com has trained over 10,000 students and claims to be the top-rated stock trading service on TrustPilot. With his team of traders, Jeff Bishop and Nathan Bear, Bond claims he can teach you how to master the market and earn substantial profits in the process. Bond’s work has been featured in media outlets such as Forbes, The Street, Huffington Post, Investing.com and Seeking Alpha. He was also interviewed on the floor of the New York Stock Exchange (NYSE) and has an estimated net worth of five million. ​Outside of merchandise and videos that can be purchased through his gift store, Bond’s two main services are his Jason Bond stock picks and Jason Bond Picks millionaire roadmap. Jason Bond Picks is a subscription service where Jason Bond details the best small cap trading opportunities within the market that day. The plan costs $399 per quarter and includes both his swing trading and long-term trading alerts. Upon enrolling, you also receive a free copy of his top-selling DVD: How to Trade Like a Pro, Not a Hobby. The DVD has a value of $1,499. So what’s included in the subscription? When you enroll with Jason Bond Picks, it’s less about education and more about following his various bets. Once he spots a winning play, you immediately receive an alert telling you what stock to buy, the price target for each and how long you should hold the positon. Then, once the position is no longer undervalued, he sends you a sell alert letting you know when and what price you should exit the trade. His logic is: if you take the time to learn from his strategy, you’ll be able to spot the same indicators and begin to profit on your own. For the long-term trade alerts, Bond sends out a weekly mix of “high-octane, high-potential stocks” prime with significant upside. The goal is to compliment the swing trade positions with stocks that add value to your portfolio over a longer duration. This way, it allows you to keep a close eye on each stock and pounce if the right opportunity arises. Last is access to the education suite. Here, you receive 24-hour access to trading tutorials, technical videos and other valuable content to help you become a better trader. Well, put simply, we can’t recommend the service. One of the most important factors when reviewing a provider is transparency. Unfortunately, Jason Bond’s stock picking service does not offer a free trial and there is a strict no refund policy. Allowing both, we believe, is essential to the validity and creditability of the service. As well, many other trading providers we assess allow some form of sampling before your purchase. Unfortunately, Jasonbondpicks.com does not subscribe to this logic. However, if the policy changes, we’ll take a second look. The Jason Bond Picks Millionaire Roadmap is his premium service. This top-dollar course aims to provide the mentoring and guidance necessary to turn you into a millionaire trader. The cost of a subscription isn’t directly disclosed, you need to contact his team, but it’s estimated in the $8,000 range. But now, everything is behind the scenes, and the transparency lacks. The Millionaire Roadmap is endorsed by professional baseball player Jose Canseco and former UFC Heavyweight Champion Frank Mir. Both say Jason Bond is their go-to stock trading coach. So what’s included in the Millionaire Roadmap? The program begins with training from its team of lead instructors, Jason Bond, Jeff Bishop and Nathan Bear. Bishop is a multi-millionaire trader with decades of experience. He also acted as Bonds’ mentor when Bond first began his trading career. Nathan Bea​r, the third member of the team, claims he turned $37,725 into $1,223,734 in just over two and a half years. With the Mastermind Webinars, you get an insider’s view of Bond and his team as they trade the market. You get to watch every trade, in real-time, and enjoy running commentary as they go along. Last is Mastermind Meetups. Held in Boston, New York, Dallas and Las Vegas, the meetings give you an opportunity to meet the guys and discuss trading strategy. 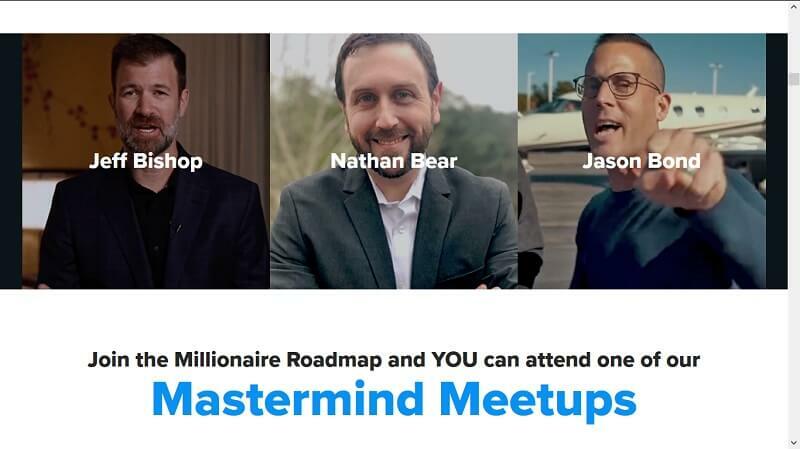 As well, attendance is free for all Millionaire Roadmap subscribers. There are also several add-ons. When you enroll in the Millionaire Roadmap program, you get access to Jeff Bishop’s Weekly Money Multiplier. During each day, he alerts you to the most profitable options trades available. He claims they can deliver a 100% increase in your position in under two weeks. Next is access to the Private Millionaire Roadmap Chat Room. Here, you can chat directly with Bond and his team of traders and you also get live email and text message alerts outlining the hottest stock plays of the day. Another is the video watchlist. The guys outline all of the trading plays they’re scouting as well as provide a quick recap at the end of the day. Finally, you also get access to all of Bond’s DVD programs. The collection includes: The Basics of Swing Trading, The House Always Wins: Intro to Selling Naked Options, How to Trade Like a Pro, Not a Hobby, and Stock Options Explained by Jeff Bishop. The total collection is valued at just under $5,000. ​So are Jason Bond Picks worth it? Again – it’s hard to recommend the service. The millionaire roadmap is quite expense and doesn’t include a free trial or a money back guarantee. Bond and his team boast significant results and try and sell the idea that you can be next millionaire student to win a brand new Porsche. But unfortunately, there is very little evidence to verify the claims. If you’re interested though, take the time to assess some of Bond’s free material before you take the plunge. And, first of all, read the Jason Bond Picks review summary for more information about the potential Jason Bond Picks scam! Unfortunately, Jason Bond does not offer a free trial for any of his subscription products. However you can register for the free Jason Bond Webinar. As a bonus, you also receive free access to his DVD collection. As mentioned above, it’s valued at just under $5,000. Ultimately, this is an offer we can get behind. Free access is essential to confirm the merit of any strategy. Check it out and see if it’s right for you. Money back guarantee: Yes and no, basically spoken, if you use the content, then the guarantee will become invalidated. So for me, it's more no than yes. Jason Bond Picks are useful for anyone with a passion for small caps and penny stocks. While it is true, small issues are much more volatile than traditional equities, they have the opportunity for significant upside. And to that point, Bond and his trading team believe they have the right strategy to take advantage of it. If you’re looking for guidance or a pilot that can steer you in the right direction, Jason Bond Picks may be right for you. But make sure to read the review summary first! Keep in mind though, his products aren’t cheap and his strategy requires a lot of study an analysis to truly perfect. Unfortunately, we can’t recommend Jason Bond Picks or his Millionaire Roadmap as valuable additions to your trading toolkit. The two products are quite expense and don’t come with a free trial or a money back guarantee. ​Day trading for beginners is ​challenging, and a beginner needs a good education. 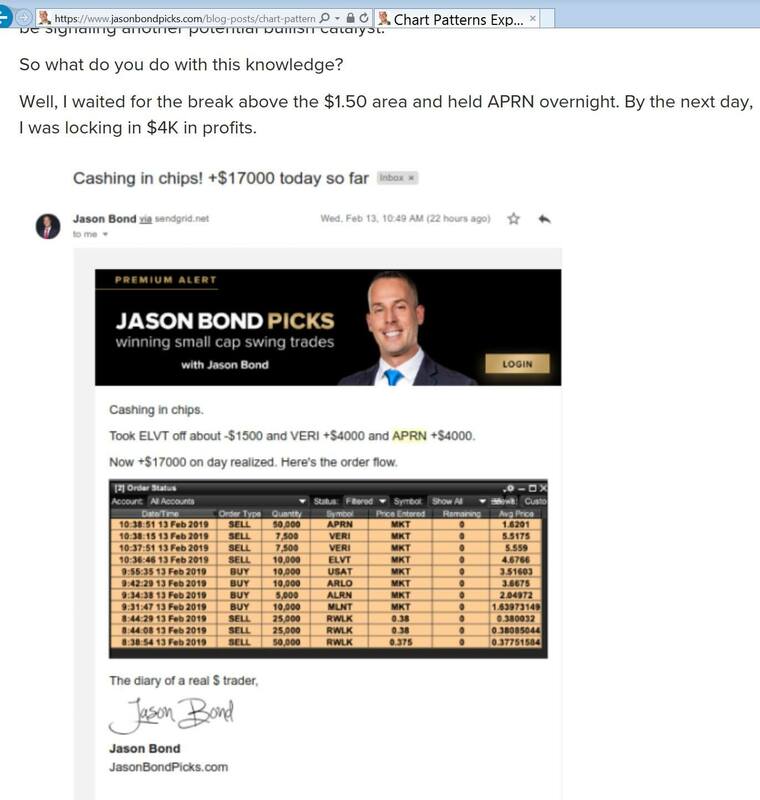 But Jason Bond Picks looks more like a marketing challenge than a millionaire roadmap challenge a beginner to day trading can win. Yes, the website layout is nice and those high return numbers sound promising. But I am in this business for more than 20 years now and I like to show you one example that makes me be cautious. ​Can you see this - he claims that he sold at the high of the day where the trading volume was so unbelievably thin, that ​it should be nearly impossible to do that. But hey, sometimes we all have lucky winners. So do me a favor and have a look at the order type he uses. MKT stands for market orders. If you hit the "sell market" button with 50,000 stocks at once, then the chart would look completely different. For this reason, I would be even more careful if you really consider trying the Jason Bond Picks service. I did not check any of his other trades, but when I see that someone says that he is trading penny stocks with such high quantities, by using market orders, then I doubt that he does it in a real money account. Have you seen any real bank statement from Jason Bond? I did not! The only trading educator I know that is publishing his bank statements is Ross Cameron at Warrior Trading. Back to the Jason Bond Picks review summary. Does Jason Bond offer a free trial? No! But free trials are essential to the validity of any trading service and without risk-free access, how can you be sure it’s legit? Based on that, our recommendation is to try the Jason Bond Webinar before you buy anything. At least if you still want to give it a try after reading this review. The free online tutorial outlines his three favorite stock trading patterns, how and where to spot profitable plays, and comes with free access to his DVD collection ($5,000 value). If you find the webinar useful and believe in his strategy, you’ll have all the data you need to justify a full subscription. But be prepared for clever marketing tactics. ​But first of all, we definitely recommend you to check out our extensive article about the ​best trading courses to get a better understanding on how the best trading course looks like. Invest the time to read the article. It is worth it.